I feel like I am announcing that my wife is pregnant, waiting until we know the baby is healthy and growing inside of her before broadcasting the good news. I think it’s safe to say this, although nothing is 100% official yet, nothing is in writing but should be by tomorrow. Last Tuesday I received a verbal job offer from the managing director of the U.S. subsidiary of a company based in Budapest. This was after I met the owners during a Skype interview, a bit odd as they were concluding their work day in Budapest. It was 10 in the morning here. There were times I had to stifle a laugh as the Hungarians on the other side of the computer webcam got caught up in their excitement over something we discussed, forgot we were watching and engaged in a full blown discussion in their language. I liked the people I met that morning, liked it even better when the managing director showed me around the small office I will be sharing with him and the office manager, then told me he was writing up the official offer for approval and presentation to me on April 25. He sent me an email tonight. They are proposing I start with the company on May 1, fly to Budapest on May 3, attend sales meetings there and train with them until May 15. I will know tomorrow if the offer is officially approved, if I will actually be working for the company. My head is spinning. All of this happened very fast. March 27 I woke up for the first time in more than 24 years without a job. March 28 I found out that this job may be coming available. I am perfect for this job, a much better opportunity than anything that would have been made available to me at my previous job, with so much potential that really depends on what I make of the opportunity. There is risk because this is a new venture, but I love the fresh feel of starting with a ground floor venture. The new company was not planning to hire until June or July, but I am perfect for the job because this company is a European equivalent to the company I worked for. I fell into their lap, made it easy for them, so suited to them that they decided they need me now! I get to fly to Budapest. Wow. I worked for a company that had offices in Belgium, Brazil, Shanghai, Toronto.. and I worked with all of them, but they never once sent me there. So much more I can and want to say. This time has been a time where God has shown me so much mercy, shown me that He really does look out for me. I have found out that I have many, many, many genuine friends and relationships.. and I am grateful. Support has come in so many ways. I want to talk about that more, but I am going to save that for another blog. Easter has come and gone, bringing with it hopes of warmer temperatures along with all manner of sprouting green plants and awakening grass. In my household that means we finally get out of the house. Our house is not a large house and after a long, frigid winter we begin to resemble Jack Nicholson in The Shining. Not that I have stayed in all of the time. This is my year to shine again on the bicycle, I have decided, and as soon as temperatures began to climb over 20 degrees I started riding my bicycle outside. I have been riding consistently since the beginning of March and am already beginning to feel good on the bike. 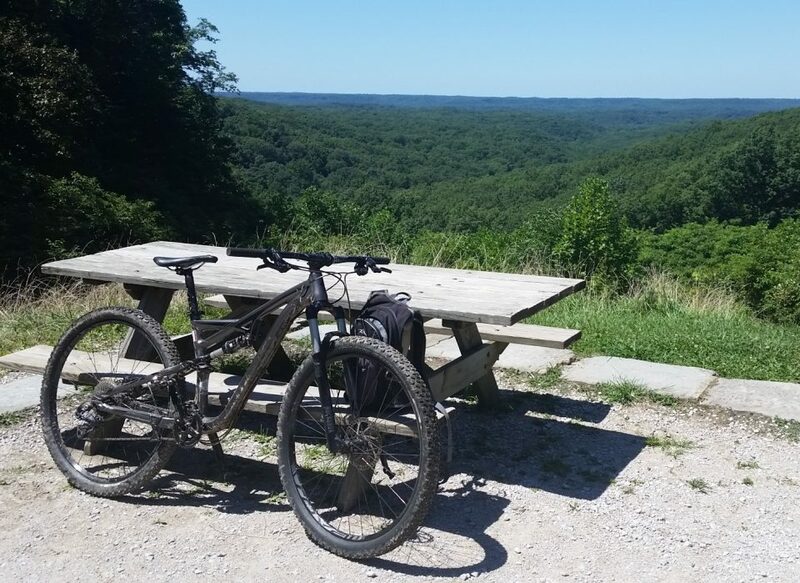 Last week I got out on the dirt trails, my mountain bike a bit rusty since my blue weenie ride in January, but the trails were perfect Wednesday night. Since I enjoyed myself so much on Wednesday, I went back again on Thursday. I ran over a rock the size of a loaf of bread, the wrong way so that it flew straight up and broke off the rear derailleur (translation: shifter) on my mountain bike. Oops. The parts won’t be in until at least this Wednesday. I got my exercise the rest of Thursday’s ride by hiking out to the parking lot with my bike slung over my shoulder. Miriam frowned when I told her. She reminded me that we don’t have health insurance right now. Oops again. It’s also fib truthfully season. Nate and I are playing golf again. Anyone who plays golf knows what I mean when I say ‘fib truthfully’. It’s an art I see practiced most on the golf course. The thought struck me last evening as we walked a fairway together that golf is the time when Nate really treats me like his father. We don’t argue. Lately Nate has been arguing with me about getting a smart phone and we had an argument about it all weekend. Did he mention it on the golf course? Not once nor did he on the way home. I realized that it’s always that way when we are playing golf. Hmmmm…. is there a way we can play golf all of the time? I might actually get somewhere with the kid. Nate is my size now. When we played golf last November, I was hitting the ball farther than him. The first time Nate and I played together this year (a week ago last Sunday), Nate was hitting 270-280 yard tee shots. He has almost always been a better golfer than me but at least I could out drive him before now. Oh well. I don’t have to be better, just available. And, finally, I thought I would share this little scene from the street in front of my house this afternoon. 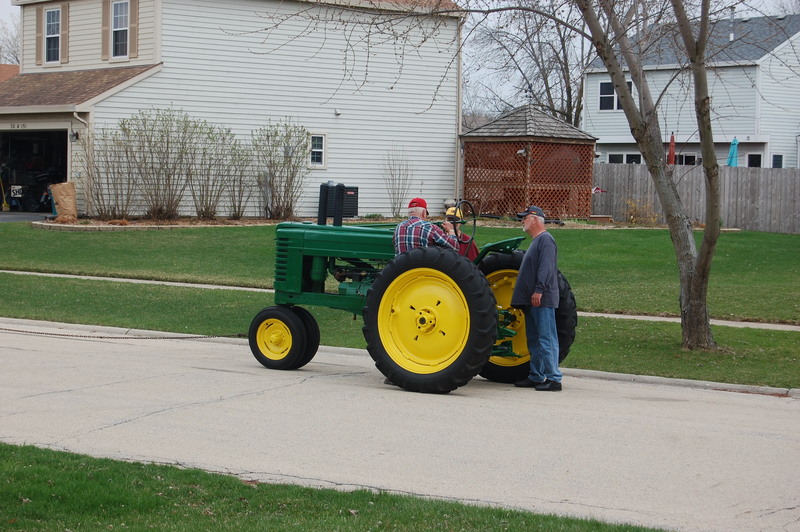 It’s my neighbor Doug getting his ten year project running, a restored John Deere tractor. Sweet. I wouldn’t have seen that happen had I been at work. Makes me think I am back home around Springfield, not in Chicagoland. I am unemployed. Some day I will write about how that happened, but for now…. After more than 24 years working for the same company, suddenly I have to try to figure out the nuances of looking for a job. Times have changed. No longer do I grab the newspaper and look up the want ads. Everything is online with most applications linking to some type of social network – LinkedIn, Facebook, Indeed. The way of writing a resume has evolved, including the necessity of inserting words that recruiters and company HR will use as keywords when they search for possible candidates. Networking is done through email and FB contacts. The old fashioned way of networking still exists and may still be the best way to find a job, however. It still comes down to who you know. In that way, 24 years experience helps. It also hurts. I am in that age category that is avoided, likely the reason why the growing company who just fired me was so eager to show me the door. My replacement will likely be a recent college graduate. They are looking for someone with an engineering degree, to fit a job description that looks like it was written with me in mind. I chuckled when I saw that. My college degree is a ministry degree. I am replaceable, I know. Just ask my wife. We are on a budget, one of those “geez, we’re going to have to sell a kid soon” budgets. The challenge is to concentrate my efforts on productive job leads. There is a whole lot of..ummm.. well.. stuff I would never consider doing that is available as employment. Gone are the days where I can go back to being a gigolo to pay the bills. Nick, our sheltie, has the worst breath in the world. Miriam calls him Tijuana Breath (she and I have enough experience there to qualify that one, especially from the ‘toilet’ facilities we had on our trips there). My typical day starts with my getting out of bed at 5 AM as I am accustomed, then I leave the house. It helps me to feel like I am going to a job. Last week I stayed away all morning because the kids on Spring break from school and home all day. This week I come home when I know my family is gone and get busy. Nick is my constant companion, a nice thing except for when Nick gets tired of waiting for me to pay attention to him, stands next to me and pants in my direction. I think the hair that I have left is turning green and curly. Several friends have encouraged me to make sure I make this a time to recuperate, take time each day for myself. That does not mean hours of Call of Duty. My lunches the last two days have been spent riding a bicycle. Three out of the last four days have seen me on a bicycle. Maybe some one will hire me to ride a bicycle? I got to see my son play, and win, his first singles match for the high school tennis team. My days have been very busy, much more than I could have ever imagined, but without the constant deadlines that seemed to be ever present during my work days the last couple of decades. Believe it or not, I miss those deadlines and the purpose they gave to me. The time without them has provided an odd feeling peaceful rest, productive, giving me energy that I have not had for a while. It’s not like I wasn’t energetic before now, but, well, it is different. The tables have turned a bit too. A week before I was terminated, Miriam was promoted to a supervisory role at the elementary school lunch room. She starts work at 7:30 AM, comes home mid afternoon. Suddenly she is going to sleep early, waking up early instead of staying up past midnight and sleeping past eight every morning. Weird. That means I can roam the house in my BVDs all day. Not really. Don’t lose sleep with that picture in your head. I do have a job prospect. I have found several opportunities. This time of unemployment may not last long at all. We’ll see.